Stevie Noble insists Tommy Wright is a big part of the long-term future of Corby Town, even if this season ends in relegation from the Vanarama National League North. The Steelmen are facing the drop just a year after earning promotion with a stunning Southern League Premier Division title success. 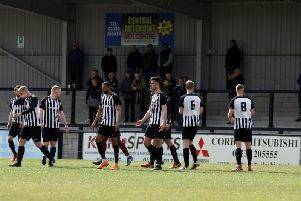 A 0-0 draw with Hednesford Town and a 4-1 defeat at leaders Solihull Moors over the Easter weekend left Corby seven points adrift of safety with just six games remaining, the next of which is a home clash with Alfreton Town on Saturday. Boss Wright admitted he considered his position following the 3-0 defeat at AFC Telford United nearly two weeks ago but chose to stay following talks with chairman Noble. And, even though relegation now looks likely, Noble is in no doubt he has the right man to lead the Steelmen forward. “I didn’t have to have strong words with Tommy,” the Steel Park chairman said. “It was quite easy, I just said ‘not a chance’! He isn’t getting out of it that easily! “I think he thought he had let people down but he hasn’t done that whatsoever. “I think he was possibly giving us a decision to make but we have massive plans for the club. “Obviously it would be easier to carry those plans out at this level of football, the higher up you are the easier things seem to happen. “But we will deal with whatever comes. We have a long-term plan here and we don’t want to put the club back to where it was when we took over. “Tommy is part of that future, especially with the work he does in the academy. “He is a young man who is learning his trade. Some people will say he shouldn’t be cutting his teeth here but you have to do it somewhere. “I know he was hurting and he is like a supporter now, he’s grown into the club and he felt let down after Telford. “He sees what the volunteers here put into the club on a day-to-day basis and he expects it off his players. “He is a young man who has a good head on his shoulders and a great work ethic.